Sole Meunière has long been a classic, a staple of French cuisine, proof to the elegance that can be found in the simplicity of a few fine ingredients. And although she in no way invented or discovered it, Sole Meunière was undoubtedly immortalized by Julia Child who fondly recalled it as her first meal in France, and a life changing moment. This single, simple meal introduced to her by her husband Paul Child seemed to awaken in her a culinary grumbling, bringing to life her palate and gastronomic imagination. And with good reason. Those of you who aspire to be like Child may enjoy online cooking schools. If that description has your stomach growling, don’t panic. You are steps away from making it. If your pantry and fridge are anything like mine, then the only ingredient you will need is the sole filets. And I even sometimes have those stashed away in the freezer. The rest? Flour, butter, lemons, salt, pepper, parsley. Those common ingredients and 10 minutes of your time are all it takes to recreate this simple – and simply divine – meal. And truly, it’s exactly as Julia Child described. Sometimes the most awesome tasting dishes are not the ones with 50 ingredients. The outstanding ones may have just a few to enhance the star of the meal and this is one of those dishes. 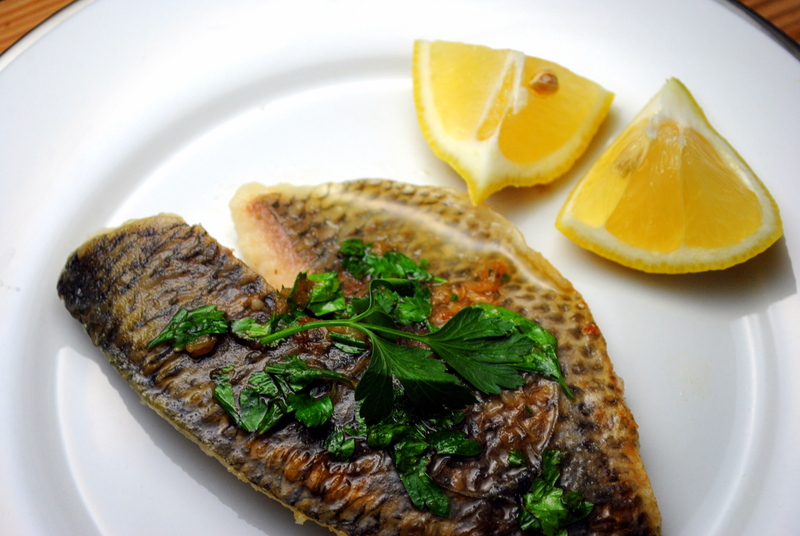 How I would love to get my hands on some fresh sole right now-yum! Great story/intro Katherine! I love meuniere and I have to try this recipe. It use more butter than I normally put but I’d love to give this a try. It’s simple yet we can enjoy the fish without overkilling with sauce etc. I need to buy good sole for this! I’m glad to be back on your blog! Thank you Nami!! Yes, it uses a lot of butter but it is oh so good! And it feels quite light despite the butter. This is one of my favourite fish dishes. I love its simplicity and I agree… when you have good ingredients, then no need to add too many different flavours! The outcome will be heavenly, just like these soles! So sorry for the delayed response! Thanks so much Manu. I agree, it’s all about the ingredients! I read My Life in France a while back and that description of her first experience with sole meuniere in France still stays with me. Such a classic dish and a pretty perfect one to begin her life over there. And your photos look great!